4 Bedroom Detached House For Sale in Helston for Guide Price £750,000. Located on the waters-edge in Porthleven with stunning 180 degree panoramic sea views and across to Prussia Cove this is a four/five bedroom detached property which is currently set up as a three bedroom main residence and two bedroom attached annexe generating good holiday let income. You enter the property through the covered porch in to the hallway featuring a spiral staircase. To the left of the hallway is a country style wooden kitchen with a range of floor and wall mounted units a built in fridge freezer, dishwasher, an integrated Neff oven and a four ring ceramic hob. Through the kitchen is the breakfast room which is triple aspect with stunning views of the ocean to one side and National Trust land to the other which is a perfect place to enjoy your morning coffee and breakfast. The formal sitting room is a beautiful space that is light and airy with the stunning sea views which can be enjoyed while sitting in the large window seat which is an ideal place to relax and read or just to watch the weather while the fire is roaring in the large bespoke handmade Cornish granite fireplace. The impressive sun room which measures an expansive 26 feet in width sits on the seaward side of the property and therefore is delightful place to be when the Cornish weather is at its best, there are French doors that open out onto a patio area where you can sit and enjoy the uninterrupted coastal views and the peace and tranquillity of the location this property has to offer, which is also a stunning environment for alfresco dining. The ground floor double bedroom has some amazing views of the ocean through the sun room and makes for a delightful way to wake up in the mornings looking at the glistening water of the ocean. Completing the ground floor are two separate family bathrooms. Rising to the first floor by the spiral staircase is the Master bedroom which is bright and spacious and has cleverly designed storage units in the eaves and an additional WC. The second room on the first floor is currently being utilised as an office but could equally be used as a guest room. The attached two bedroom annexe is being used as a holiday let but could effortlessly be re opened to join the main house by the connecting door if you wished to return it to a substantial four/five bedroom family home. Currently the annexe is a single story with its own separate external access and parking. It has two double bedrooms, one with en-suite bathroom and both with enviable sea views; sitting room, kitchen and bathroom with shower over head. The entire annexe is immaculately presented and has many repeat customers due to the quality accommodation on offer and the unparalleled position. The surrounding grounds that this beautiful house has include various patios appointed to enjoy the stunning views, gardens on two sides of the house and greenhouse. There is driveway for multiple vehicles, two garages, utility rooms and gardeners WC. 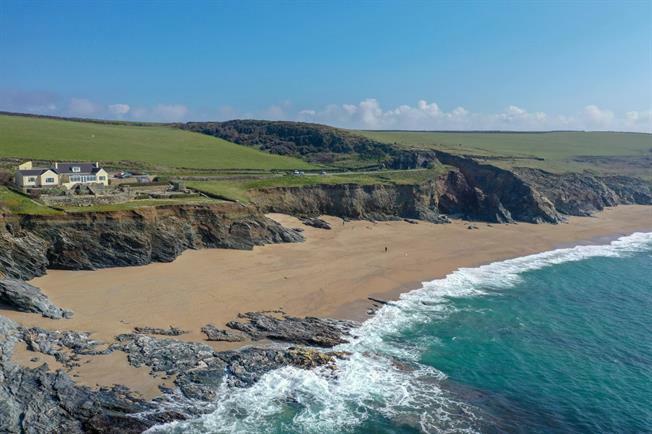 There would not be many properties in Cornwall to rival such expansive sea views. Porthleven, mainland Great Britain’s most southerly port, sits on the south Cornish coast between the Lizard Peninsula and Mounts Bay and like almost a third of Cornwall, sits in an Area of Outstanding Natural Beauty and is surrounded by stunning coastline and countryside. The South West Coast Path runs through the village and links nearby villages for the avid walker. Porthleven has three inns, several very highly regarded restaurants including Kota, Rick Steins, The Square and Sea Drift. Other amenities include a primary school, supermarket, post office, doctors surgery, fishmongers, delicatessen and art gallery. Just outside the mouth of the harbour is the Porthleven reef break, one of the finest in the UK and ever popular with experienced surfers who visit from all over the world. The following services are available at the property Mains Electricity; Oil fired Central; Mains Water; Private Drainage; Telephone and Broadband connectivity, although we have not been unable to verify connection at this time. Council Band ‘F’.